Bag Snob finally finds a Dior bag worthy of buying! Stylehive wants you to get gilded and glamorous with 24k gold beauty products! The Jet Set Girls fall in love with Lancome's Indigo Collection and offer an exclusive discount in Lancome stores. Stiletto Jungle shows off three options for getting in on the multi-strand necklace trend. All Lacquered Up shows you step-by-step how to save your split, cracked nails with Orly Nail Rescue. Gwyneth is spreading the detox joy and Allie is Wired has the details. Bag Bliss loves Alexander McQueen's Skull Knuckle Duster Whipsnake Clutch! Beauty Snob is all about teeth whitening with Darphin Denblan. The Daily Obsession finds out what Pixi Beauty creator Petra Strand is currently obsessed with. I'm Not Obsessed shows you where to get 'Gossip Girl' Blake Lively's chic Treesje bag. Did I mention it transforms into a clutch? KRISTOPHER DUKES is wanting, wearing, and hating Silk Robes. Second City Style's resident male editor attended Miami Swim Week and shares his views on hot swimwear trends for 2010. Shopping and Info wants a Rick Owens black leather jacket for Fall. The Beauty Stop has 5 ways to get rid of freckles. The Fashion Bomb compiled 100 Fashionable Items to bring with you on vacation--a one stop guide fit for any jetsetting fashionista. Visit The Shoe Goddess for a chance to win a $200 Saks gift certificate! V-Style is giving away NuNaat hair care products to the reader who has wavy or curly locks. Love that weighty bag and high, high heels? eye4style has tips on surviving your accessories from a leading physical therapist! Rich hues are in this fall and give your outfit a pop of color with a purple handbag. I love this Kooba Amber Shoulder bag ($545 at Neiman Marcus) for it's roomy size, not so flashy gold hardware, and cool looking bow detail. British designer Sophie Hulme takes the military look to new heights by embellishing typical military gear with sequins. As dazzling as it may be, the overall look of her Fall 2009 collection is quite clean and minimalistic with grays, blacks, and deep purple taking over the palette. Each piece of clothing also comes with a special charm that changes every season. So for all you crafty folks, you'll be able to make a quick charm pendant or charm bracelet. See more of Sophie Hulme's collection in the slideshow at Stylehive. Cardigans all year round are my "go to" item to throw over a tank or t-shirt. With the weather in the Bay Area, you never know when a little wind will pick up in the summer and these sweaters are the perfect transitional ones as we move from summer to fall. I'm loving Anthropologie's Gentle Current Cardigan ($88) that comes in some great colors such as pink (pictured above), purple, a heathered black, and neutral motif. Pair it with a long sleeve t-shirt in a contrasting color to make it fun! 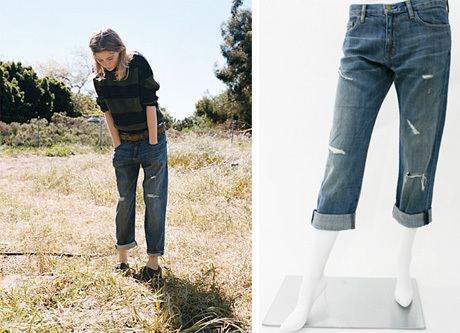 The Jet Set Girls discover the new skinny Madewell '37 jeans for under $60! FashionPulseDaily is obsessed as of late with the the recycled metal jewelry of Alex and Ani! Stiletto Jungle checks out the new Quiksilver Womens line. Stylehive takes you to Miami for the Zimmerman runway show at Mercedes-Benz Fashion Week SWIM! Allie is Wired has a first look at Britney Spears's new Candie's commercial. The Daily Obsession learns from Mizu Salon that balayage is the best kind of highlighting and offers readers $50 off to see her colorist! I'm Not Obsessed gives you a sneak peek at The Tigerlily Swimwear Spring 2010 Collection. KRISTOPHER DUKES is wanting, using, and hating Leica DigiCams. Second City Style and 12 other fashion bloggers filmed this video campaign to help keep your favorite designers in business and we need your help! Shopping and Info wants this ruffle dress by Michelle Mason. The Beauty Stop investigates the new Aroma Sothys bath and body line. The Shoe Goddess finds a fabulous pair of over-the-knee boots for less than $300! Don't you love this Yumi Kim Hippie Floral Shelly Dress? Well, you can win this beautiful dress from chickdowntown.com by entering in our Coquette Giveaway today! This is a perfect summer frock to wear on its own or paired over leggings. I love Yumi Kim for all her feminine floral prints. Created by fashion designer Kim Phan, Yumi Kim infuses "flirty bits of quirkiness and hip appeal". Phan was inspired by vintage prints and silhouettes and her fashion line now is a hit among the fashionista set. To enter to win, just leave a comment to this post about your thoughts on Yumi Kim! Please make sure your email address is in the form field (won't be published). All entries must be received by Saturday, August 1, 2009 at Noon PST. The winner will be announced in August here on Coquette. Good luck! And for the latest chickdowntown.com news + cool fashion giveaways, follow @chickdowntown on Twitter and become a fan of chickdowntown.com on Facebook. I'm in the mood for a new pair of glasses and I am in love with the look of these PRISM London frames. Inspired by vintage frames from the '50s and '60s, designer Anne Laub also was inspired by street style in New York, Paris and Rome. (Her frames are named for the inspiring cities.) The unisex collection has bold frames in cat-eyed, oval and square shapes made in cool colors like midnight blue, zebra tortoise and clear. Each pair of glasses is handmade and hand finished using traditional techniques. See more in the PRISM frames slideshow on Stylehive. Congratulations to Wendy from Pomona, NY for winning a pair of Current/Elliott jeans in our Coquette & chickdowntown.com Giveaway earlier this month! Thanks to everyone who entered. Stay tuned lovelies - I have another fabulous giveaway coming up tomorrow! Shoes this fall take a nod to classic menswear with oxfords and spectator takes. I love these the Scarf-Tied Oxfords ($128) and the Tri-Tone Spectators ($208) both from Anthropologie. The look sharp with a great pair of pants! When technology breaks down like my laptop did last week, I realized I had more downtime so I could finally finish up my DVR recordings of The Hills. (Unfortunately, I couldn't post to Coquette toward the end of last week! Sorry about that!) As much as the show annoys me and I know it's not real, I can't stop watching. It's my guilty pleasure. In her Hills goodbye episode, Lauren Conrad wears this adorable blue Valentino Red dress. Although the dress is cute, what really caught my eye was how stunning the shade of blue is. I have a feeling we'll be seeing more of this rich, versatile color.